Kim Kardashian hasn't tried to impress a pianist this much since ... well, ever ... because she's taking lessons from a classically trained musician -- and no, she's not only playing the black keys. Kardashian family sources tell TMZ ... Kim recently reached out to classical pianist Oksana Kolesnikova after a recommendation from no less an authority than Kenny "Babyface" Edmonds. We're told Kim's been laser focused on her lessons with Oksana -- who, by the way, might be the hottest piano teacher in L.A. ... not that it matters. You might think Kanye West is her musical inspiration -- but we're told Kim's interest in piano goes back to watching her father play when she was a child. She also played violin in grade school, and plans to pick that up again ... since Kourtney just gave her one for Christmas. Kim could make her debut in May -- Oksana tells us she's invited her to perform at a recital where her students show off their skills. We're told Kim has a special song planned to surprise her family. 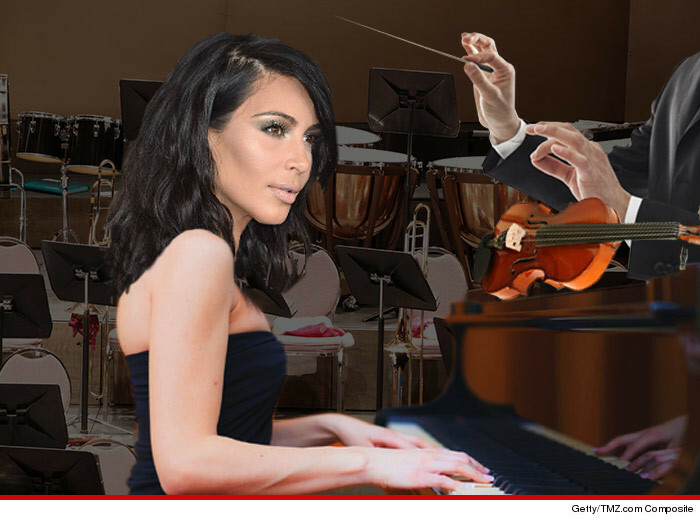 Kim Kardashian tickling ivories ... imagine that.